Wage stagnation is not a new phenomenon but a structural change in the US economy. 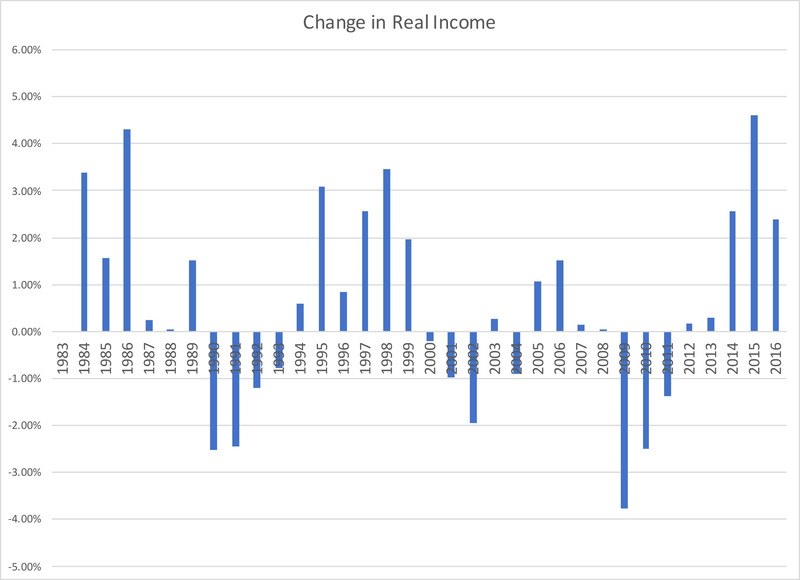 Looking over the last 34 years, real income remained almost unchanged. Because of the wage stagnation economic growth in the US grew moderately. As disposable income remains relatively unchanged, people have little room to increase spending. Because of low spending growth, there is a limited upside potential for the economy to grow. At the same time, any disruptions to personal income can cause abrupt decline in consumer spending. Since consumer spending explains 70% of Gross Domestic Product (GDP) in the US, the decline in spending can cause economic slowdown and a recession. Historically, the real income did not change much, consumers’ purchasing power remained roughly the same (see Chart 1). 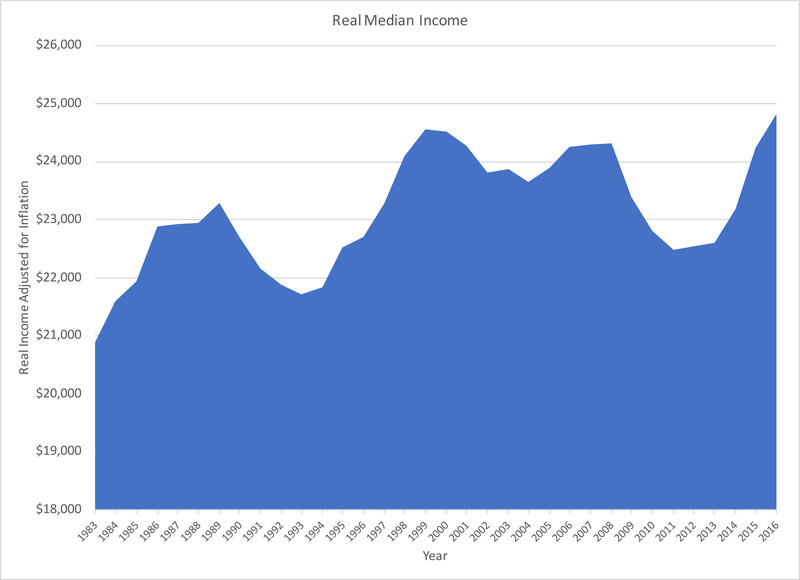 In 1983, the real median income was $20,885. 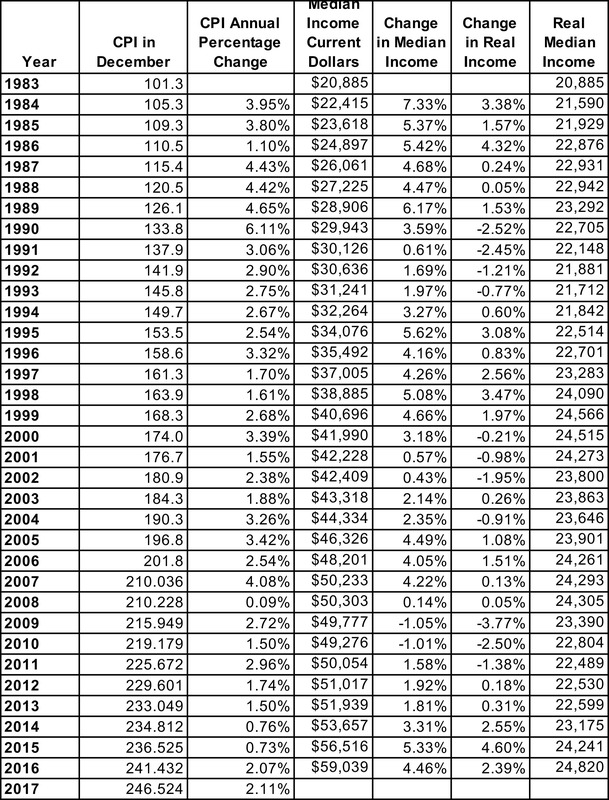 When I adjust for inflation, the real medial income in 2016 was only $24,820 in 1983 dollars (see table 1). Since 70% of the economy is based on consumer spending, without the increase in disposable income, the economic growth is destined to remain low. During the last 34 years, salary grew at a very low rate. From 1983 till 2016, the real annual income fluctuated between +4.6% and -3.77% (see chart 2). Also, if I take a simple average, I will get 0.55% increase in real wages during 1983-2016 time period. The median US consumer who relies on wages as a single source of income experienced the wage stagnation for the last 34 years. This consumer had increase in disposable income of 0.51% per year. As disposable income remained subdued, the consumer was not able to increase spending by much. If the history is any indicator, the real growth in wages is going to be very low in the future as well. Having a structural wage stagnation, deflation can improve the wellbeing of consumers. Consumers are better off when prices decline and worse off when prices increase. Consumer can afford very little increase in real spending, about 0.5% per year. If inflation rises by more than wages increase, consumers will not be able to afford some goods and services. Consumers will start cutting on spending and become selective buyers. Before, the US advocated for free trade and globalization. Free trade policies lowered the price on goods and services and kept inflation low. As the result, the increase in salaries was greater than the increase in inflation. Since the wage stagnation is a structural element of the US economy, having lower prices on goods and services was the best way to increase consumers’ wellbeing without increasing wages. Now, the US is moving away from the free trade and implementing protectionist fiscal policies. The US is imposing sanctions and tariffs on other countries. The trade war between the US and the rest of the world will cause prices on goods and services to increase. Since wages will likely to remain stagnant, the US consumer will have little extra income to absorb the increase in prices. As prices rise, consumer will spend less on discretionary goods and services. Consumer spending is responsible for about 70% of GDP. Due to a potential increase in inflation and stagnant salaries, discretionary spending will decline. The decrease in spending will slow down the GDP growth. On one side, fiscal protectionism is rising prices and slowing down the economy. On the other side, monetary policies are lifting interest rates and make borrowing more expensive. In June 2018, the Fed raised its short-term interest rate to 2%. The Fed is expected to have two additional interest rate hikes by the end of the year which will result in 2.5% interest rate. The first interest rate hike after the 2008 financial crisis was on December 16, 2015 when the Fed raised its target interest rate from 0.25% to 0.50%. The increase in federal funds rate can make floating rate and short-term debt more expensive. This will increase the cost of debt to consumers with the credit card debt, Home Equity Line of Credits, and any other short-term debt. Since consumers will not afford to borrow in order to spend more, and their salary will remain unchanged, the increase in prices will cause a decrease in spending. In support of wage stagnation and risk of economic recession, the long-term treasury yields did not increase as much as short-term yields did. 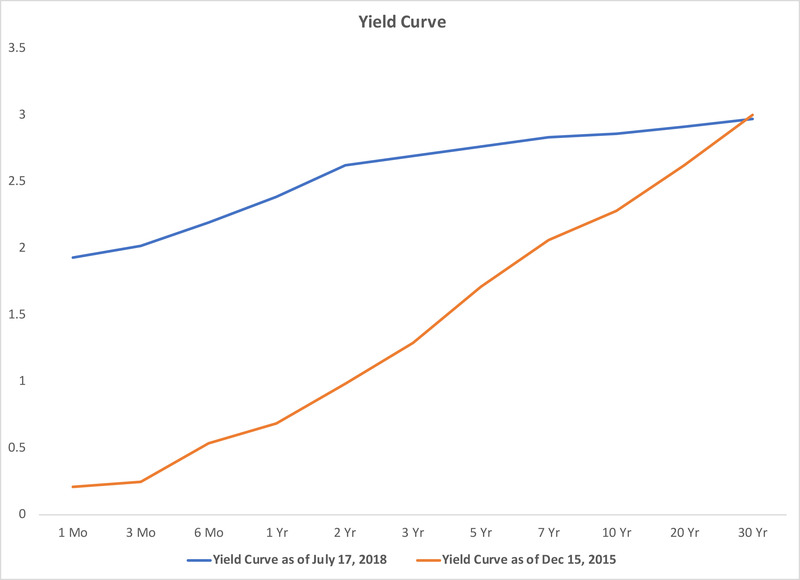 In opposite, the yield curve became flatter (see chart 3). For example, 10 Year US Treasury yields increased from 2.58% on December 15, 2015 to only 2.86% on July 17, 2018 (Yahoo! Finance). Markets believe that the risk of economic recession is much greater than the risk of inflation. The prices may rise in the short term, but the decline in consumer spending will cause economic growth to decline. The US economy has a structural wage stagnation. For the last 34 years, wages have been growing at the effective real annual rate of 0.51%. Consumers who rely on salary alone, cannot increase discretionary spending too much. As fiscal policies become more protectionist and monetary policies more restrictive, consumers will not be able to afford increase in spending. As discretionary spending declines, economic growth will slow down. This creates a risk for the next economic recession. Forecast of future economic growth and stock market performance is based on historical data and future expectations that may not be correct. This paper was written as an opinion only. The data is not guaranteed to be accurate or complete. Please consult with your financial advisor before making an investment decision.